﻿ Dowel pointer tool for furniture, to chamfer large dowels in hollow augers. Dowel pointer wood joint for branches in rustic furniture. Tenon cutting tool for round tenons at the end of large branches. Make a wood joint with concentric dowels in cone shaped holes. Dowel pointer woodjoints. Dowel pointer tool for furniture, to chamfer large dowels in hollow augers. 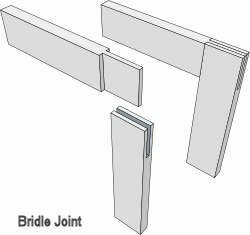 Free furniture plans » Joinery examples how to make joints in woodworking. » Make rustic farmhouse furniture from branches with a spoke pointer. Chamfer large diameter dowels with a spoke pointer tool. How to make farmhouse furniture with a spoke cutter tool. A spoke pointer has been used for centuries to fit spokes for cartwheels. 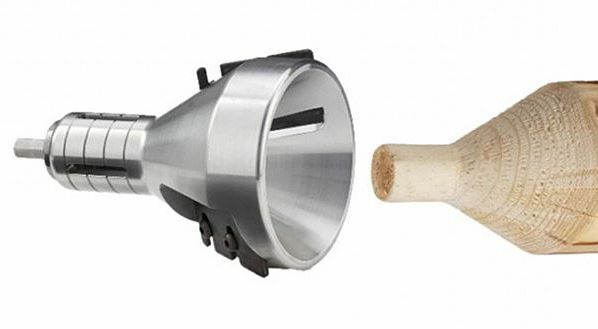 As a result of that they are still commonly known as spoke pointers. 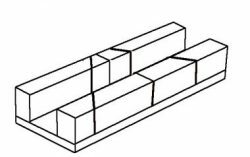 The dowels that are made with this tool form an integer part of the construction material, usually round wood. These pointed ends are made either with the branch in a lathe or with the dowel pointer fitted to a drill. 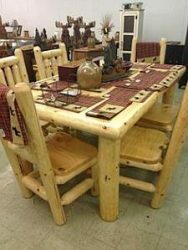 Furniture made with these wood joints is very rustic. 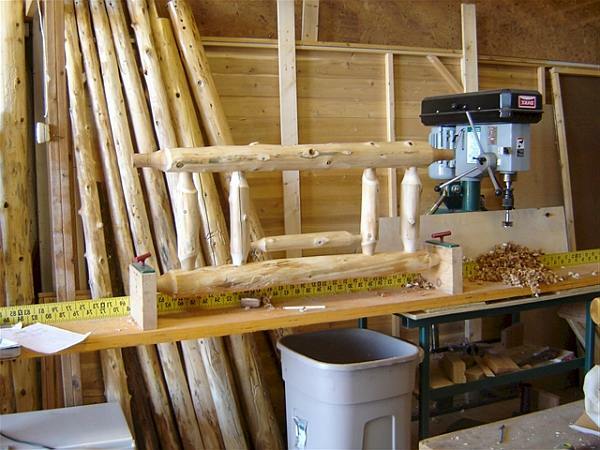 These large dowel connections for wood are especially suited to make farmhouse furniture from thick branches. Glue the spokes in the auger, use nails or screws to fixate the parts together. Assembly of tables chairs and stools from branches. This method to make furniture is very old. 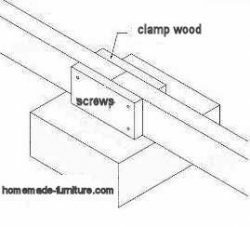 It is a wood joint that looks very good, and it provides a nice strength for the construction as well. You can use comical dowels or straight dowels, the first is a bit easier during the assembly. The latter, straight dowels, usually have a better fitting. Those large dowels can be glued without further need of reinforcement. The conical, pointed, dowels however do benefit for a nail or screw to hold the wood joint in place. Bear in mind that woodglue is not always suitable for use outdoors, which is where this furniture will probably be used. 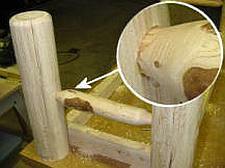 Make dowelled wood joints for branches in farmhouse furniture. Hole cut to adapt a pointed dowel. This tool is usually fitted to a power drill. 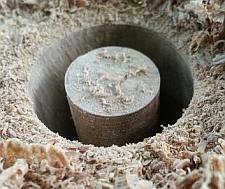 Another and easier method to make pointed dowels is by using a lathe. Quite a bit of strength is required to hold your drill when this spoke cutter bites into the wood. Round spruce is excellent timber fot these wood joints. It is cheap when you buy it at the store. Its is also the easiest materiall because of the fairlly uniform shape. On the other hand there are free tree trunks and dead branches which you can use. 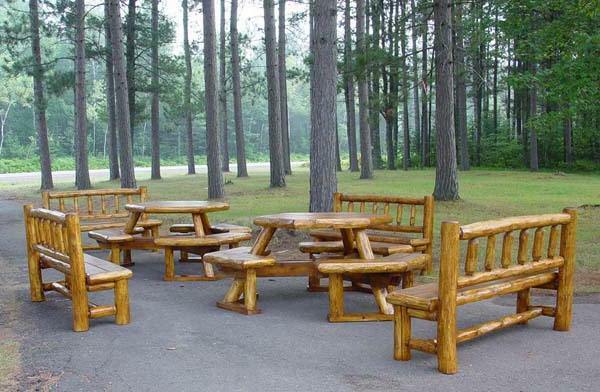 Apart from the rougher looks it is also great to make these rustic tables and benches even more eco friendly. 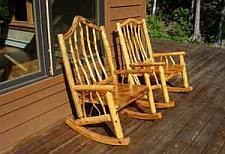 Garden furniture made from branches with a pointed dowel cutter. Two tools to make a woodjoint with large dowels. Great looking set for garden or terrace. 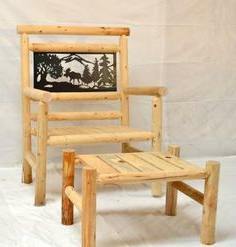 Table chairs and benches made from branches found in the forrest. Free timber is readily available if you assemble the furniture with pointed dowels. 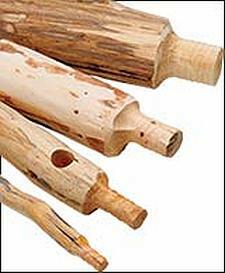 There are several types of tools to make these dowels and the corresponding holes. On this page we show just a few of these spoke cutters and tools to make large dowels. Spoke cutter tools to make a pointed dowel wood joint. 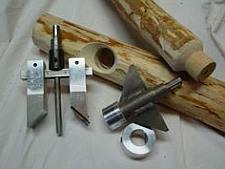 The are several models and types of tools to make wooden spokes and pointed dowels. How to use each tool is best seen on the included instructions, but you can see the basics on these pictures. Pointed dowels made with a spoke cutter on the lathe. 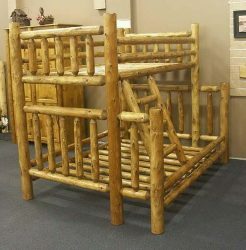 Probably the best method if you are going to make this farmhouse furniture from branches and tree trunks. It will save you a lot of time and effort when you use a lathe and column drill for these pointed dowels and concentric holes. Wood workshop with machnery to make farmhouse furniture from branches and tree trunks. These examples for the use of a spoke and dowel cutter tool have been inspired by the Dutch woodworking pages on Steigerhout Bouwtekeningen. Make a rustic farmhouse log table. Use your imagination to transform dead trees into furniture. The way that a tree and branches have grown will partly dictate its final shape as furniture. The pointed dowels are probably the best wood joints for farmhouse furniture. 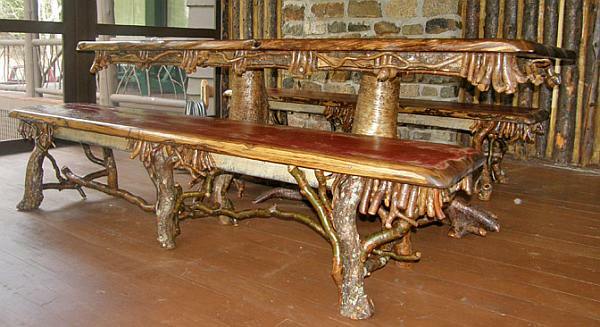 Table made from a tree trunk and branches. The classic method to use dowels in assembly of furniture. Dowels for a pin and hole connection to make wooden frames. More methods for carpentry and joining wood.